Welcome! The Sharon Renkes Piano Studio has been successfully growing Music Makers in the greater Columbus, Ohio area since 1987. 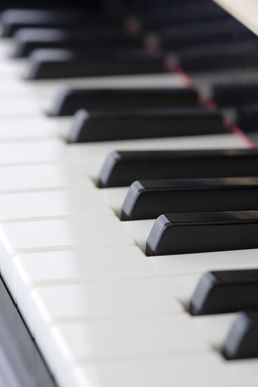 Private piano lessons are offered for beginning through early advanced level students, ages 5 - adult. New students begin their lessons as soon as openings are available in the teaching schedule. Most students begin with 30 minute lessons, increasing to 45 and 60 minute lessons as they progress. Specific teaching material is chosen for each student and individual lesson plans are developed. During the Fall, Winter & Spring (September 1 - May 31) each student's lesson is once per week, at a set day and time. Summer lessons (June 1 - August 31) use flexible scheduling to allow for camps, vacations and family activities. All music instruction takes place in the piano teacher's personal home studio located in the Clintonville neighborhood of Columbus, Ohio. Free on-street parking and WiFi are available. The studio's learning atmosphere is calm and positive, with lesson content focused on each student's individual learning styles, needs and goals using digital and acoustic pianos, rhythm instruments, music themed games, solo and ensemble playing, singing and body movement. Students are exposed to a variety of repertoire and music styles, theory, ear training, music history, beginning composition and improvisation, along with performance opportunities for sharing music with the studio family and in the community. The curriculum is designed to introduce each student to the world of music past and present, develop appreciation for music and artistic skills, learn to play the piano expressively and to read music fluently. Visit the studio webpages for more information about these topics: Meet the Teacher, Tuition & Fees, Lessons for Kids & Adults, Piano Holidays & Weekly Teaching Schedule, Studio Policies for Attendance, Missed Lessons & Payment, Acoustic Pianos vs.Digital Pianos & Keyboards, Piano Practice/Tips for Success. Want to meet Sharon and her pianos? PLEASE NOTE: Sharon Renkes (the teacher) reserves the right to photograph students during all studio activities. Such photographs, become the property of the Sharon Renkes Piano Studio and will be used, with parental permission, at the discretion of the teacher for studio purposes only.